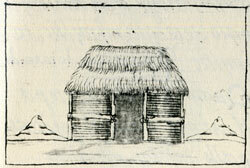 ‘The dwelling of an ordinary peasant family was a one-room rectangular hut with an earth floor, a low open doorway, and no chimney or windows. The walls were made of stone or, more often, of mud brick on a stone foundation, or else of wattle and daub, the traditional building material of the countryside... 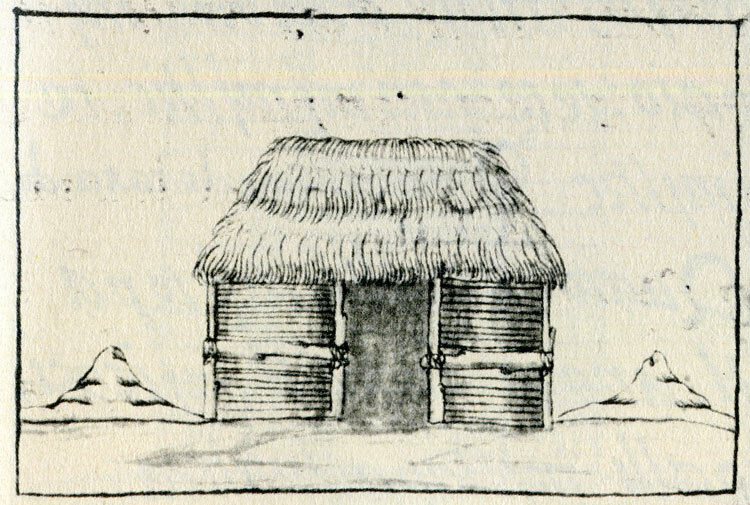 The most common form of room, depicted over and over again in the manuscripts [see Florentine Codex image] was a simple gabled construction made of thatch. ‘Close to the main building stood turkey houses, a sweat house for taking steam baths, and a few bee-hives made from hollowed-out sections of tree trunks with the ends stopped up with mud. 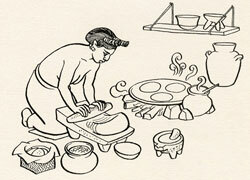 ‘The house was primarily a place for eating and sleeping rather than for relaxation. Torches made from pine knots provided the only illumination, and the inside of the house was sparsely furnished. 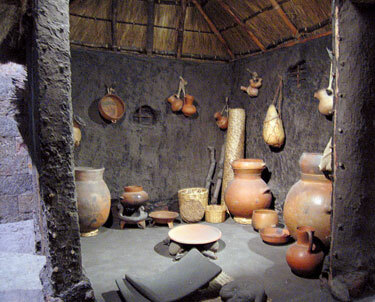 Reed mats served as beds and seats; wooden chests held the family’s clothes and possessions, while around the room stood the objects of everyday use - brooms, the husband’s digging-stick [’uictli’], seed-basket, tools, hunting or fishing gear, the wife’s loom, her water jar, cooking and storage pots, a vessel containing maize kernels soaking in lime water, and the stone on which she ground the maize [’metate’ in Spanish, or ‘metlatl’ in Náhuatl]. Each household owned one or more images of the gods, made in wood, stone, or baked clay, and in some huts a cage containing a talking parrot or a small songbird hung on the wall. 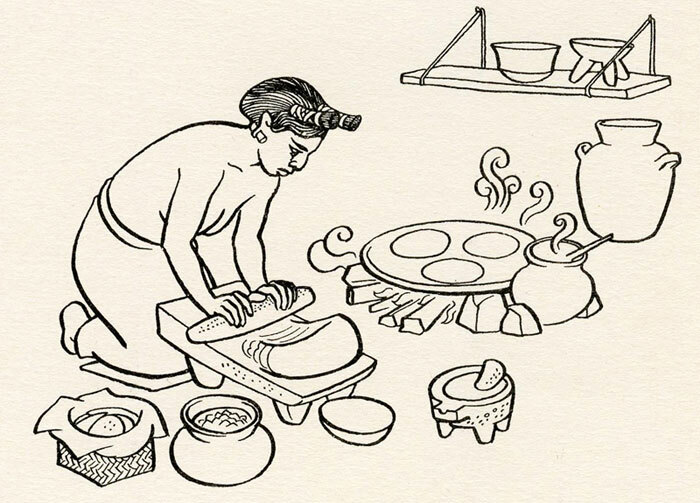 How many of the items described here can you spot in this model of a simple Aztec house? Some researchers have pointed out yet more levels of symbolism in the positioning of objects within the house as well as in the space they occupied. There may well have been separate ‘zones’ in the home - one for female activities and another for male: metates and jars have often been found to the right of the entrance while flint blades and other pieces made by men for their work were on the left.